Schiedel Isokern products can be used for new chimneys construction and for refurbishing existing chimneys. These systems provide a lightweight, easily installed and versatile chimney which can be used internally or externally. The systems are suitable for use with burning appliances in new and refurbished projects. They are ideal for Masonry, Timber Frame and Steel Frame construction. The Schiedel Isokern Double Module block system is a quality chimney system, used extensively in Scandinavia and other parts of Europe. The double wall system maintains flue gas temperatures while preventing heat transference to the outer casing. The separation of the inner and outer components also allows for thermal movement, reducing the risk of cracking and subsequent leaking or staining. It is simple and quick to build. The Double Module is available in 3 outer casing sizes – DM36, DM44 & DM54. Theses Pumice Systems are suitable for wood – logs, pellets and chips, solid fuel, oil and gas. The diameter of the appliance outlet determines the diameter of the chimney required. CE certified to EN1858 with the designation T450, NI, D, 3, G(00). The Schiedel Isokern fire chest complements their chimney systems which are designed to create a complete system, avoiding a lot of the variable factors that lead to draught problems and smoky fireplaces. The Isokern range uses a lightweight, highly insulating pumice. The components interlock like a three dimensional jigsaw to form a sturdy, robust fireplace recess and gather. The joints are sealed using lip glue jointing compound. Starting from a suitable foundation and constructional hearth, assembly of the complete fire chest and gather could take less than one hour. 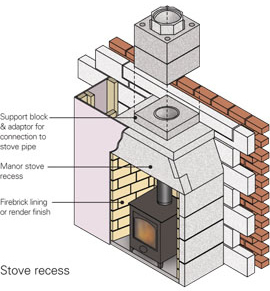 The range includes fire chests with fire openings from 500 to 1250mm and a recess designed specifically for stoves. Each fire chest is packed on a pallet with detailed assembly instructions. 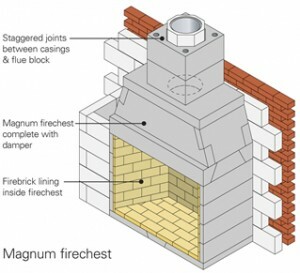 The fire chest is load bearing and will carry up to 2600kg of chimney above, although you may exceed this weight with the use of additional lintels. The new Schiedel Isokern Magnum Firechest range has been designed to maximise the burning efficiency of wood in an open fire. The specially shaped fire chamber facilitates the efficient burning of wood logs to give efficiencies from 41% to 45%, depending on the model chosen. The fire chests are tested to EN13229.